The news was also announced to the general public who rejoiced at the news. Unfortunately, on the 31st January 1510, Catherine went into premature labour and gave birth to a still-born baby girl. 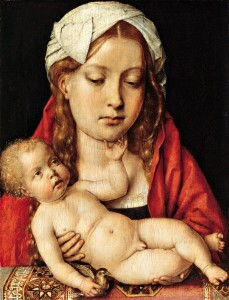 Although she had lost her baby, Catherine’s abdomen stayed rounded and actually began to increase in size, leading her physician to conclude that “the Queen remained pregnant of another child and it was believed”. It appeared that Catherine had lost one of a pair of twins. The couple, who had obviously been saddened at the loss of their little girl, clung onto this diagnosis even when Catherine began to menstruate again. At the end of February 1510, Henry ordered the refurbishment of the royal nursery and Elizabeth Denton, the former Lady Mistress of Henry’s own nursery, was brought out of retirement in anticipation of the birth. In March 1510, Catherine entered her confinement and waited for her labour to begin. It never did. Eventually Fray Diego reported that the swelling had decreased and that Catherine was not pregnant after all. It seems to have been a phantom pregnancy. A shaken and embarrassed Catherine finally wrote to her father on the 27th May 1510 telling him that she had just miscarried, a blatant lie but understandable considering what she had been through. Rumours then began to circulate that Catherine was barren and that she would never conceive but Catherine proved these wrong. As she was writing to her father about the miscarriage, she was actually pregnant and on New Year’s Day 1511 Catherine gave birth to a son, Prince Henry. However, the celebrations were short-lived as the little prince lived just 52 days, dying on the 22nd February 1511. I can’t even begin to imagine going through that…and in the public’s eye no less. Catherine was definitely a strong woman!!! I give her a lot of credit for being so strong and sticking strong to her faith–through everything she went through! Poor Katherine! What a horrible thing to go through on one’s own but as a queen, it must have been dreadful. That would have taken quite an emotional toll itself, however coupled with the rumours and knowing that she had to produce a son…I cannot even fathom what she must have been going through. Plus, then to give birth to a son only to see him die 52 days later, just unimaginable. I feel so sorry for her. I can not imagine having a miscarriage or having an infant die. I would be a basket case. She certainly had a lot of strength to continue on in the public eye. I know that infant mortality rates were higher back then but it still must have been hard on the parents. I just can’t think is would be very comforting to know that many infants did not survive when it is your baby. Catherine is sometimes blamed by historians for the whole confusion over the pregnancy and miscarriage, but I think this is rather unfair. There was a history of twins in her family (her sister Maria was one of twins, the other having been stillborn), so her doctors may have considered this when they told her she was still pregnant after the miscarriage. It is also possible to continue menstruating whilst pregnant – I know someone to whom this happened. As a young woman in her first pregnancy, it is not surprising that she believed what the doctors told her, particularly as it chimed in with what both she and Henry desperately wanted. Hi Claire, I read somewhere (I cant remember where!) that although the little girl was still born Catherine named her Isabel (or Isabella?) after her mother. Is there any proof of this? Of course little did she know then, that this was the beginning of the end. I think Catherine of Aragon should be canonized as a Saint….truly. She comes awfully darn close. I do not have a clue what the protocol and requirements of being canonized are, but she should definitely be looked into. Possibly Queens cannot be considered for Sainthood…I just do not know.